Saxons and Celts celebrated Beltane on the 1st May, it was a ‘fire’ festival, Bel standing for the God of Sun, the day was all about welcoming the return of the sun after winter; fire and torches were often part of the festivities. May Day was originally a European festival, and focused on celebrating spring, nature and Earth and keeping the land fertile so that reproduction would be strong. The May Day pole goes back to these times, although in those times the erecting of the May Day pole was just as important as dancing around it. The addition of ribbons, children dancing and Morris dancers is more recent and is representative of the celebration moving away from its pagan pre-Christian roots. 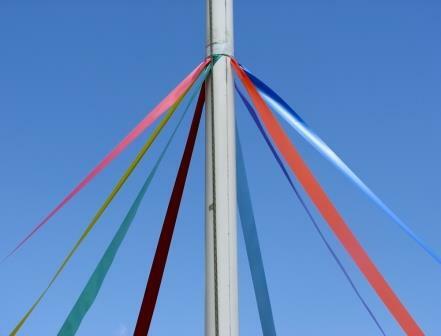 In the seventeenth century Puritans did call for a ban on all May Poles, something that didn’t work and festivities still take place in the UK, Germany and America today. It was once thought that a child born on May Day would be inflicted with the ‘evil eye’, and that babies born in May were generally considered unlucky. If you sat inside a ‘fairy ring’ on May Day or May Eve then you could fall under an enchantment and be stolen away to the land of the fairies. Along with babies, kittens that were born in May were considered to be undesirable and unlucky; it was thought that they would bring unwanted creatures into a home such as snakes. During May washing your face in the early morning dew was supposed to give you a perfect complexion. It was also believed to prevent freckles and stop you tanning in the sun. Further to this a maiden washing in the dew on the first day of May was granted a wish!